Don Youngblood was enjoying a peaceful Saturday morning. Then, his previous boss from New York phoned for a favor. A belly dancer is missing and a financial hotshot employee is lovesick and under-performing. Youngblood's Mission: Find the missing belly dancer. Problem: A male witch (warlock to some) is also looking for the belly dancer. A few days later, a call for help from a previous local client whose granddaughter has been kidnapped and Youngblood's life is anything but peaceful. A kidnapping, serial killer clown and a sleaze-bag from the past who has seemingly risen from the dead are all part of a second case; one that leads Youngblood through a labyrinth of clues and dead ends to a shocking and deadly conclusion in the desert of New Mexico. 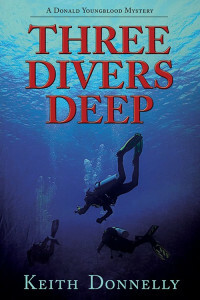 Three Divers Deep proves to be another crackling entry in the Donald Youngblood Mystery Series. Price includes shipping in the Lower US only!